Unlike the timeless children’s story with Dorothy, her red slippers, the tin man, the scarecrow and the cowardly lion, this slot game is all about the Wizard of Odds (not the Wizard of Oz) who helps turn the odds in your favour as you spin the reels of this delightfully magical slot game. In the background of this slot game, you’ll see a lovely stone castle and the yellow brick road leading the way through the snow-capped mountains. This 5-reel, 20-payline slot game is full of magical features and magical bonuses which are not only entertaining but rewarding too – cast your own spells, mix your own potions and select your own wizard’s hat to give yourself free spins, multipliers and big wins! Fans of other Novomatic slot games, such as Dolphin’s Pearl Deluxe, Mermaid’s Pearl Deluxe and Book of Ra Deluxe will enjoy spinning the reels of Wizard of Odds by Novomatic! There are plenty of regular and special symbols which fall on these magical reels. The regular symbols pay out when you spin three or more of them on an active payline, on consecutive reels from left to right. In ascending order of value there is: the 10, the Jack, the Queen, the King and the Ace; the wizard’s magical staff; a picture of the wizard himself and the Wizard of Odds symbol. Simply adjust your bet to suit your gaming needs by choosing the number of lines you want to have active and the amount you want to bet on each active line, and then have a look at the paytable to see how much each winning combination of symbols will pay you. 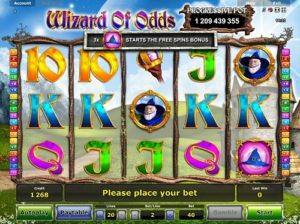 Wins can be gambled in Wizard of Odds slot game, using the gamble feature. For this feature, you’ll be faced with a choice: black or red! If you choose correctly the colour of the next card, you’ll double your win but if you choose incorrectly, you’ll lose it. The only time you won’t be able to gamble your wins or change your bet is if you’re playing in autoplay mode. There is also a Wild symbol in Wizard of Odds which is the word ‘Wild’ in front of a crystal ball and this symbol can substitute for all other symbols. There are three different special features in this slot game: the Cauldron Bonus, the Spellbook Bonus and the Wizard’s Hat Bonus. Each of these are triggered by spinning a certain special symbol (or a number of special symbols) and they each do something different to help you get those big wins you desire! For the Cauldron Bonus to be triggered, you’ll need to spin three cauldrons on the reels. When this happens, you’ll be taken to a special room where the wizard is mixing a potion in his cauldron and it will be your task to add vials of coloured liquid to it. Keep on pouring and your win will keep increasing, and if you manage to make the cauldron explode, the progressive jackpot will be all yours! For the Spellbook Bonus to be triggered, you’ll need to spin a spellbook symbol on the middle reel. When this happens, it will open and as long as the spell keeps working, your win will keep increasing! Lastly, for the Wizard’s Hat Bonus to be triggered, three wizard’s hat symbols will need to fall on the reels. Choose a hat to reveal the number of free spins you’ll get and then choose another hat to reveal the multiplier for your free spins wins!